A few years ago, I halfway consistently posted under a series that I liked to call Happy Hour Chats. I’m bringing the concept back every month (or so I hope) and am rounding up what we did for the month, what I bought (or didn’t buy), recipes we loved, books that were devoured and so on. Sometimes I miss the old days of blogging, where I could just write to write, so this is my way of bringing it back. It’ll be a bit more personal and if you’re here for that, great! I’m happy to have you. 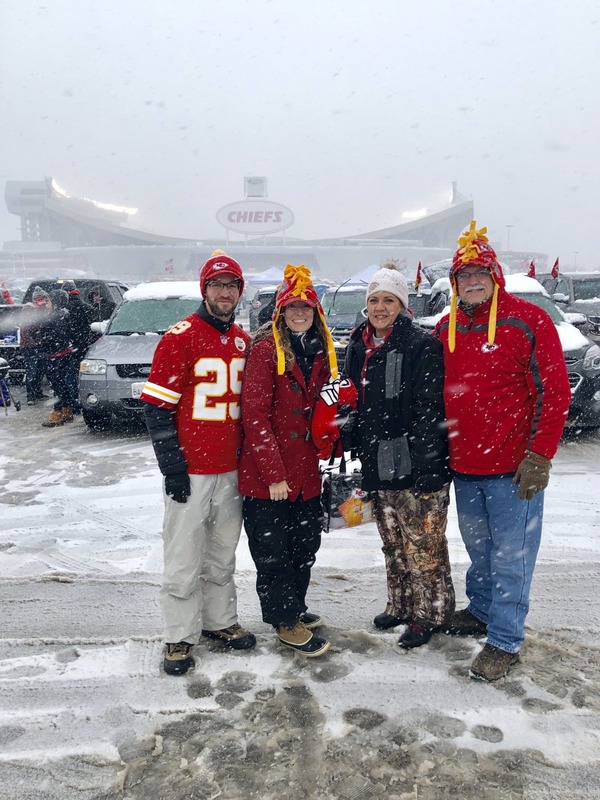 We spent two of our weekends in Kansas City cheering on the Chiefs in the playoffs! Both weekends were SO COLD, but so fun. I was pretty heartbroken when they lost in the AFC Championship Game. Luke was upset too, but I think he was halfway, secretly, relieved because I was planning to use our renovation budget for the year on Super Bowl tickets if we had won. LOL. I enjoyed listening to Ellen Degeneres on Oprah’s Master Class Podcast. Hearing about how she got into the business and more about her personal life. We’ve been trying to do a movie and pizza night as a family halfway frequently. One of the last movies we watched together was Anne of Green Gables. Do you remember that? I loved watching it again. Greyson, for sure, was a little put off by Anne, but ultimately enjoyed it. We put a basketball goal on our back patio! It’s a weird space to put it but it’s been GREAT!! We all go out and play now that it’s within sight of the kitchen and the ball doesn’t roll down the hill! We made progress on the powder bath and laundry room. With being gone over two weekends though, it’s slow going. I’m on a mission to get Greyson’s room organized. He has so many Legos so it’s been a challenge. I think I’m finally onto something though and will share soon. A few weeks before Christmas, I bought myself a new cookbook. Who spends money on themselves before Christmas? Ha! Anyways, I’ve followed The Faux Martha blog for a few years. I really love the cooking tips that she shares and her house is just beautiful. Anyways, she came out with a cookbook last year call The Minimalist Kitchen. Over the last four weeks, we’ve tried about six different recipes and have LOVED them! I just peeked at her site and it doesn’t look like any of the recipes in her book are on her site. She does have lots of recipes there too. I’ve become a lover of hot tea. I’d never been a tea drinker before I got the flu in October. Around then, I was drinking so many different type of herbal teas trying to help clear all the chest congestion. Anyways, my newly-found love of tea stuck and I’ve been finding new ones that I like left and right. Recently, though, I’ve really loved this Sweet & Spicy flavored herbal & black tea. My mother-in-law dropped a few packets in my stocking at Christmas and I’ve been hooked ever since! I’ve been reading more advanced chapter books to Greyson at night for awhile. It’s something we both enjoy and I always try to pick something that works for both of us. Well, we just finished Harry Potter and The Sorcerer’s Stone: The Illustrated Edition and we were both wowed by it. Neither one of us had read it before and really loved both the story and the illustrations. I also read: The Plan (interesting perspective on reactive versus non-reactive foods), Uninvited (like parts of this but thought parts were fluffy) and Sage Living (would love to find this book at a secondhand store). Nothing! Whoa! I didn’t intentionally tell myself that I couldn’t buy any home decor but that’s what happened. I’ve really been focusing on purging, organizing and renovating so that’s been great. I don’t need to buy this pillow or that new vase to be happy with my spaces. They just need a little love with freshening up. Hope you enjoyed this post. It’s a bit like a diary post, just made publicly. Kinda random, but fun. Cheers!